Art market Ljubljana was the first art market in Ljubljana, established in 1999. A vibrant young tradition developed over 18 years ago next to the Ljubljanica river. 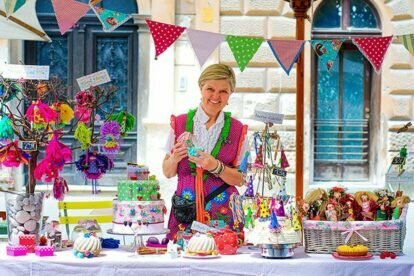 In the shadow of the chestnut trees where local and visiting artists set up stands, a non-touristy market offers a great selection of the best and quality Slovenian arts & crafts products. The market focuses mostly on fine arts, such as paintings, graphics, sculptures, photography, design fashion and handicraft products. The market allows people to contact artists directly, and to get an impression of their work and working process. I love to take a walk on the renovated Breg embankment area by the Ljubljanica river where this summer Art market takes place all summer long. I mostly enjoy the lively atmosphere every Saturday morning, where I usually meet friends, talk to the artists and enjoy stands with unique and colorful products. Although the peak season for the Art market is during the warmer months of the year, the artists also present their work in the beautiful atrium of the Slovenian post on the main Čopova street between 18th till 23rd of December this year. This is definitely an excellent alternative to the numerous tourist souvenir shops in the city centre, it’s no wonder Art market is also referred to by visitors of many countries as one of Ljubljana’s best-loved attractions.